Welcome to the near future. Welcome to Spillover, the first expansion for Peak Oil. 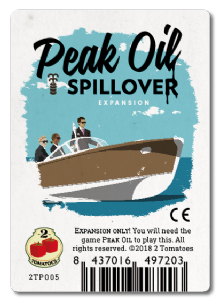 Spillover enriches and diversifies Peak Oil by adding variant cards, which change the fundamental rules of the game, and new Demand, Risk, and Security markers. You need the base game to play. The variant cards introduce new ways to play Peak Oil. They're divided into the categories General, Agents, PR, Endgame, and Scoring, depending on the aspect of the game that they affect. In each game, you can use up to one from each of the five categories, allowing for up to 42 millions of different combinations (made up number). The new cardboard markers can be used with or without the variant cards. There are new refineries to ship oil to, new dangers to be found on the shipping routes and new Security markers. As the top executive of one of the world's leading MegaCorps, your task is to improve the public image of your company through the wise manipulation of the 4 biggest Media Conglomerates.